Home - Ars Brute Squad - Enjin - Heroic HFC Cleared! Arch is dead! We have Mooses! Heroic HFC Cleared! Arch is dead! We have Mooses! Sunday night was a long time in the making. 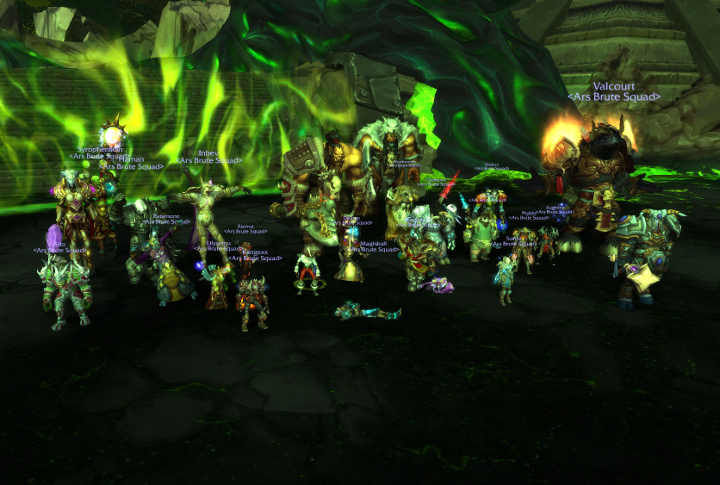 ABS Prime downed Heroic Archimonde for the first time. Grats to all who attended. Special thanks to Sito and Kangaxx for helping with the final strategy that lead to our kill and Brehon for pitching in on heals. Pictured above: Syrophenikan, Dadhyanc, Auginine, Devilsdeath, Jkmaulings, Deamp, Patamonn, Riemst, Lilysatou, Kangexx, Brehon, Rootrooster, Sito, Ghostti, Makasi, Valcourt, Phybbs, Haman, Magiskull, and Inbev.